CCL Secure and De La Rue have been awarded contracts to supply the base material for the UK's new polymer £20 notes. CCL Secure - which already provides polymer substrate for the new £5 and £10 notes - will supply 75 per cent of the first call-off volume in the new 10-year contracts, which will see De La Rue provide the remaining 25 per cent. 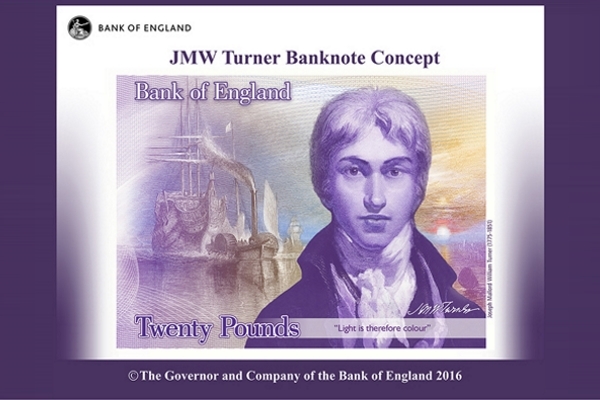 The new banknote is due to be issued in 2020 and will feature the artist J.M.W. Turner. Production for this contract is expected to commence in fiscal 2018-19, and the next call-off is expected to take place in 2021, according to the Bank of England. The BoE commenced the formal tender process for the supply of polymer substrate for the £20 banknote in March 2016. In a statement, De La Rue said it launched its Safeguard polymer substrate in 2012, adding that it is now used by 15 issuing authorities across 21 denominations and is one of the group's fastest growing product lines.Production volume of Safeguard nearly quadrupled last year and is expected to double again this year, according to the company. CCL meanwhile - whose Guardian substrate is used in the current polymer notes - said it is "looking forward to continuing working closely with the Bank in bringing cleaner, safer, stronger banknotes to the British public."